Racer X Asylum - View topic - paul gilbert hoodies and shirts. where can we get it ? paul gilbert hoodies and shirts. where can we get it ? Hmm! i hate being swedish at this times! he should really sell merchendise on his site! he should really sell merchendise on his site! The white cattle skull shirts were the same ones they sold at the viper gigs. But at the viper gigs they were $20 at G3 they were asking $30. The black cattle skull hoodie looked sweet but I couldn't get myself to part with the $50 they were charging. I'm currently unemployed so money is a little tight right now. 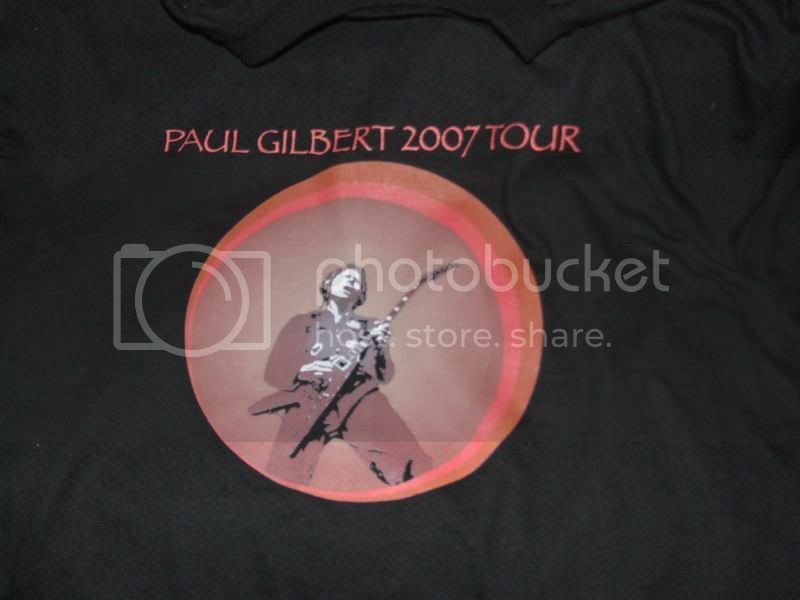 Heres a pic of the Paul 2007 tour shirt. I got all three and an extra white cattle shirt hoping i'd get it signed. I'd be willing to sell it if anyone wants it here. They charged 30 bucks (STEEP) at the show so just 30 + shipping***. I think it's a large, PM me if you're interested. Edit: I decided to just keep it on my wall, i'm gonna start a PG shrine.